In this book, I consider how the process of newsgathering and daily journalistic routines work together to produce the language we see as unique to daily news and define as being journalistic. 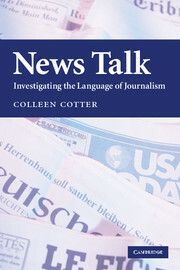 The book explores news language from the vantage point of the practitioner, focusing on the activities that journalists engage in, the knowledge they utilize, the ways they are taught to gather news and to write about or broadcast it, and the news values and other commitments that influence their decisions about the news. It gives a heretofore unexplored perspective from which to evaluate everyday news language, focusing on elements of practice and process and their relation to text, talk, and social meaning. Linguists and journalists both have a keen interest in language, as well as descriptive protocols, audience/interlocutors, interactions, and community. Despite this shared focus, the ways each profession looks at language, audience, and community vary tremendously. The book is intended to foster a dialogue between two professions for whom language and social life are central; and for each group – the researchers and the practitioners, the academics and the journalists – to consider language in the media differently. The main objective of the book is to develop an ethnographic view of the language of everyday journalism and an interactional sensibility in analyzing it, through which we come to understand how and what language is produced by the news community, and its relation to an intended audience. an ethnographically grounded approach to media analysis, and to offer new insights for journalists and others into reading news language. to expand the range of research possibilities in both linguistics and media-related studies. I intend for the book to have two primary academic audiences: those with linguistic training who may be unaware of the range and potential of the news media as a site of research, and those with a media background who are unaware of the approaches and insights linguistics can offer. In general, the book is intended to appeal to anyone with an interest in the media (e.g., communications and media researchers in other social science-based disciplines such as political science and sociology). The audience for the book I hope will include not just sociolinguists, discourse analysts, and linguistic anthropologists, but also journalism educators and students, communications and media researchers, and reporters themselves. The approach I take draws from the overlapping traditions of sociolinguistics, discourse analysis, and linguistic anthropology, building on the methods and assumptions of interactional sociolinguistics (Duranti and Goodwin 1992; Gumperz 1982a, 1992; Schiffrin 1994; Tannen 1984) and ethnography of communication (Bauman and Sherzer 1989; Duranti 1988; Gumperz and Hymes 1964, 1972; Hymes 1972b, 1974). Ethnography of communication utilizes anthropological field methods and linguistic analytical tools to determine the role that language plays in a community, to understand “ways of speaking” or communicating within a broad context which is itself relevant. It is a deliberately holistic approach that scrutinizes all dimensions of a communication exchange, however brief or extended, whether strictly linguistic or not. Viewing news practitioners from the ethnographic-linguistic framework allows us to see how the interactional and textual norms of a discourse community interrelate with the larger civic community in which they operate, as well as to understand the motivations, conventions, and rituals of a community and their output in discourse. Thus, the relation of language to social interaction and practice – and their realization on different linguistic and cultural levels – is a key premise upon which the book rests. In this way, it follows in the traditions of linguistic anthropology (akin to ethnolinguistics in the UK and current sociocultural paradigms more generally) for which the understanding of a community and its display of communicative competence is paramount. It is a deliberate alternative to the social science-based or social theory-based analyses customarily applied to the media, which tend to neglect or overlook the role of practice and process – and even of language – in their approaches. The news media and its influence in society have long been scrutinized by social science scholars and political scientists, although the language dimension has been given short shrift except in the application of content analysis (a quantitative approach which codes individual words and decontextualized phrases in a restricted corpus of data). More recently, linguists and discourse analysts have begun to bring their tools to the task, on the sociolinguistic end of the spectrum examining the social message encoded in accent use, deletion of articles like “the,” and the representation of social groups; and on the discourse-level end analyzing interviews, reported speech, and the framing of topics. In this book, for the purposes of disciplinary clarity, I differentiate the sociolinguistic work that involves variation and style or a similar close analysis of language from discourse research that addresses larger stretches of text and talk beyond the word or sentence level, and combine the two levels of analysis in my own approach to data. The text has been the primary focus of most media researchers to date, particularly as the text encodes values and ideologies that impact and reflect the larger world. (Perhaps the most robust and widely influential linguistic framework currently is that of critical discourse analysis (see chapter 1), a British-European-born approach that blends social theory with a close analysis of a selected text or set of texts to evaluate the discursive construction of power in society.) The second dimension, that of process – including the norms and routines of the community of news practitioners – has been on the research agenda for the past several years, but to date no significant work has been completed (but see research by Bell 1995; Cotter 1999a, 1999b, 2003; Jacobs 1999; Jacobs et al. 2008; Perrin 2006, Perrin and Ehrensberger-Dow 2006; Peterson 2001). With some exceptions (starting with Bell 1991 and Cotter 1996b and continuing most recently with Turner 2007 and Van Hout and Jacobs 2008) a fair amount of linguistically oriented research into media language and media discourse is compromised by a lack of knowledge about what comprises the normative routines of daily journalism. Yet it is everyday practice that shapes the language of news. It is thus a ripe area for further research, and the focus of this book. by theoretically and methodologically introducing ethnography of communication and the contextualization of practice, focusing on the interaction between journalists and their audiences, going into the newsroom for data, and enlarging the scope and geographical center of the inquiry. I take advantage of the fact that ethnographic observation and understanding provide evidence that is not easily available through corpora, interview, or close-text analysis. In its cross-disciplinary, holistic endeavor, the book uses a wide range of data gathered through newsroom fieldwork, interviews with practitioners, my own past experience as a daily newspaper reporter and editor, and archived news stories to look at the subject on three levels: those of language, discourse, and practice. Using examples from a variety of newsroom and field sources, primarily in the US, I touch on profession-specific speech events and processes that encompass both ideological and linguistic norms. In the interest of time and space, I rely mainly on print contexts, but also use examples from broadcast and Web news domains. The empirical range of the book involves ethnographic interviews with practitioners, material and analysis deriving from actual newsroom observation, incorporation of various texts (trade journals, internal memos, textbooks, style guides) published specifically for and generally circulating within the community of journalists itself, and mostly print media examples – either to illustrate various linguistic and discourse-level points I am making, or to demonstrate a pattern of usage that is significant. To a limited extent, I also draw on my own insights about the profession from my experience within it. (1) Most of the current work on media discourse is done by scholars from outside of the US and uses non-US data (with the exception of broadcast and print media like CNN, The New York Times, or The Washington Post); there is not as much linguistic research using American media examples as one would think. This means that American journalism, as journalists in the USA would see it, is not part of the broader academic discussion (although see Hill 2007, Lakoff 2000a, and Peterson 2007 for relevant discipline-situated critiques of US story coverage of interest to reporters). (2) I discuss more than just major articles or widely familiar news stories. As I look at the relation of the news organization to the community it is covering, that means considering the local element, and “smaller” but equally recognizable stories. At the same time, I look at similarities across communities and geographical domains, and point to the differences as markers of local identities. (3) I focus on interactional and contextual elements as much as on a body of text; I also employ the interpretive traditions of ethnography and anthropology, and orient my claims to cultural contexts and communities with which I am familiar and in which I have participated. The ethnographic perspective has served me well. I came to England to live for a year and to study linguistics virtually the very first minute I left my news career (more on that at the end of this Introduction), and was hyper-aware – professionally at first and gradually linguistically – of what was different about the English press and the American media, as well as what was similar. After reading the Brighton Evening Argus for a few months, I realized that many of the issues of local coverage were identical to ones I was familiar with in the States, such as complaints about the store-owners’ holiday decorations in the main shopping areas or worries about over-development, historical preservation, and area schools. In short, I saw similarities on the level of content; but variance at the level of discourse, e.g., attribution rules, and ideology. The notion of a prestige press, for instance, does not resonate in mainstream, non-journalistic USA, although the down-market association linked to “supermarket tabloids” does. That early “making strange” ethnographic experience (cf. Agar 1980), reinforced by return visits and the past seven years living in London, means I have some intuitions about UK media in a comparative sense, and will include relevant data from the British press, the comparative element being an important analytical technique (cf. Hymes 1972a). Ultimately, though, it is well to recognize that just as there are differences between American English and British English, and the two countries’ cultural norms, there are significant differences in the media paths (more about which I will explore in future research). The Oakland (Calif.) Tribune (Chapter 5) – editorial story meetings (field observation). The San Francisco Chronicle, The Sacramento Bee, Los Angeles Times (chapter 8) – the three main newspapers in California; to examine the depiction of a divisive state ballot initiative as it proceeded through an election cycle and beyond and to illustrate simplification rules within news discourse. The Redding (Calif.) Record Searchlight (chapters 7, 9) – a diachronic comparison of sentence-initial connectives. The Washington Post (most chapters) – to illustrate various points regarding text, relationship, and community of practice, and The New York Times and London metropolitan and UK national press by way of comparison. The Miami Herald/El Nuevo Herald (Spanish version) (Chapters 4, 5) – for supplementary field data. Wire stories transmitted by The Associated Press and Reuters. Metropolitan dailies in various cities, etc. Smaller dailies from different geographical areas, etc. Professional publications, newsletters, press releases. Relevant ephemera found in newsrooms or museums. Archived material from my newsroom and journalism teaching days. Larger corpora that were used are the Lexis-Nexis Database (the General News database, which comprises major newspapers in the USA and elsewhere, e.g., London, Singapore, Bombay, Hong Kong, etc. ), and a daily “news wall” at a specialist museum (formerly in Rosslyn, VA, it is now located in Washington, DC). The Newseum (an “interactive museum for news”) gets electronic transmissions of the front pages of more than 500 newspapers, big and small, from around the country and the world, which are printed out in full color and at full size and displayed in a “Today’s Front Pages” exhibit outside the Newseum. I use the “news wall” as a synchronic repository – to illustrate similarity and difference and their implications. (For example, in one entry in my Rosslyn-era field notes, the Salt Lake City (Utah) Tribune had two stories about the Book of Mormon and the Church of Latter-day Saints (LDS) on Page One as well as the expected stories on what was happening internationally. Any other newspaper in a state other than where the LDS headquarters are located might make brief mention of the Mormon-focus stories only in their Saturday religion page, if that.) The use of the Lexis-Nexis Database, the Newseum’s “news wall,” and stories selected from The Associated Press Web archives, means that I cite at least several dozen newspapers from around the US, and take care to avoid the usual fronting of more internationally known papers, or of what counts as the US’s prestige media. I also attempted to choose illustrative examples that would not “date” because of topic (hence a larger number of weather stories than would be found in a typical paper). I do not examine television in detail, except to discuss the interrelationship of the different media outlets, such as CNN or the BBC. I also talk a bit about local/regional TV and radio and the role they play within a community inside and outside the USA, and the unique differences in news production. Broadcast “institutions” such as CNN are referred to in the same context as USA Today – per their historically significant role in the development of modern media, but no extensive analysis will be done. I note the evolution of the genre of TV news as well as how Web journalism has influenced story structure, content, and register and is causing significant discussion within the news industry – within newsrooms and within journalism schools. the story, to the way in which media practice influences news discourse and news language. It is divided into sections which correlate to the process: the news-community values and premises that background reporting and editing decisions and actions (Part I); conceptualizing the news (Part II); the processes of constructing the story (Part III); and dissemination of news and its impacts (Part IV). Throughout, I establish the premise that individuals who work for media organizations such as daily newspapers can be viewed as members of their own speech (or discourse or practice) community, presupposing the role of language as a primary way of marking community boundaries. The interactional and ethnographic approach to investigating news language is set up in Chapter 1. News media discourse is best understood when the reporters, their intended audience, and the stories they write are considered as related parts contributing to a whole. Analytic approaches that allow a focus on practice, cultural and communicative competence, and an understanding of the norms and constraints of social interaction, will give a more complete view of the language that is produced by the media. Within the ethno-interactional scope, the tools of discourse analysis and sociolinguistics can be fully implemented to consider language structure, function, social organization, and worldview. Journalists are socialized to approach their work in particular ways that both influence the shape of the text and reinforce their identities and professional roles, and this will be addressed in Chapter 2. Their work is motivated discursively in terms of craft and ideologically in terms of press freedoms and a commitment to the public. Writing and reporting well, and attending to an audience for whom the craft is intended to serve, are organizing principles that create coherence within the profession. Understanding these motivations creates alternative ways of understanding journalistic dynamics, a key step in understanding what shapes journalistic language. Chapter 3 examines the ways reporters learn to report and editors learn to edit. The professional socialization of most journalists today begins in the classroom, where courses focus almost exclusively on learning practical skills. After that, the newsroom provides a constant reinforcement of competent practice, for both novices and veterans. Over time, the “ways of speaking” and writing in the journalistic context become internalized, functioning to formulate a professional identity as much as a news product. The values that underlie journalistic production are the focus of Chapter 4. Newsworthiness is determined by a set of simple factors or “news values” that function as guidelines for decision-making at every step of the news process. News values are one of the most important ideological factors in understanding the shape of news stories and the decisions of journalists. the “story meeting” or budget meeting, where editors talk about the stories that will appear in that day’s newspaper (or broadcast). The story meeting, which I discuss in detail and illustrate with a case study in Chapter 5, is a crucial site for the emergence of values that pertain to the media context. As decisions about coverage and story play are negotiated, so are internal news values and external community values negotiated and reinforced. Traditionally, news stories are produced with a group of listeners or readers outside the newsroom in mind (although economic factors lead to other production objectives, as Barnhurst and Nerone 2001 and Schudson 1978, for instance, have outlined over different phases of news history, and Simon 2008 has noted in the new millennium). To explore the interaction-based nature of journalism is to challenge some fundamental models of mass communication and assumptions about the way journalists relate to each other. Relying on sociolinguistic insights, in Chapter 6, I introduce the dynamic of the “pseudo-relationship” (extending Daniel Boorstin’s influential 1961 notion of “pseudo-event,” or a constructed, non-organic circumstance like a press conference which is reported on by the media) to characterize the relationship between the media and the public. I also demonstrate the multiple ways in which “interaction” can be identified in the journalistic context, and how the Web is making more transparent this interactive relationship (or “participant framework” as a linguist would describe it, or “interactivity” as the news community would say). Story design and the role of the lead are described in Chapter 7. The structure of news stories follows a particular order, influenced by what reporters identify as the most important or newsworthy element. This element is emphasized in a variety of ways in the “lead,” or first paragraph or beginning of a story, from the strategic use of passive voice in print to vocal emphasis in radio to the use of visuals in television. More than any other textual demand, writing a good lead is the most advanced of skills, generally acquired last by learners who have already mastered other aspects of good story design: organization, placement of attribution and quotation, and insertion of background and context. A primary task of the reporter is to clarify and simplify the complex, a task that interacts with other discourse demands, such as maintaining neutrality, and summarizing previously reported details of a story when covering it again. “Boilerplate,” the summary material that is inserted in continuing stories to remind readers of past circumstances, is one manifestation of a complex discourse demand whose implications become significant when the story is linked to more divisive issues. Using print media coverage of a contested California ballot initiative concerning the rights of illegal immigrants as an example, in Chapter 8 I characterize what was included and what was left out of boilerplate summaries of a complicated social and political issue. Despite what outsiders might conclude, the media have a fairly conservative attitude toward language use. In Chapter 9, I orient the social and structural factors of language standardization to the practice and attitudes of the media, and examine journalism’s role in relation to language style and standard language ideologies. The processes behind news reporting also create conditions in which communicative demands supersede prescriptive habits. News language both reflects what is socially acceptable usage as well as what is conventionalized and contingent within the profession. Chapter 10 concludes with a very brief discussion of the impact of the news process on media discourse, including the constraints of the physical world (time and space) and ways to “read” the newspaper as a journalist does; the impacts of journalistic priorities on the representation of linguists and anthropologists in news contexts; and suggestions (and a checklist) for future research. I will reiterate my underlying motive: that journalists and linguists have a lot to talk about and learn with respect to their shared but divergent professional interests in language, and it is my wish that this book can help the discussion and collaboration along.